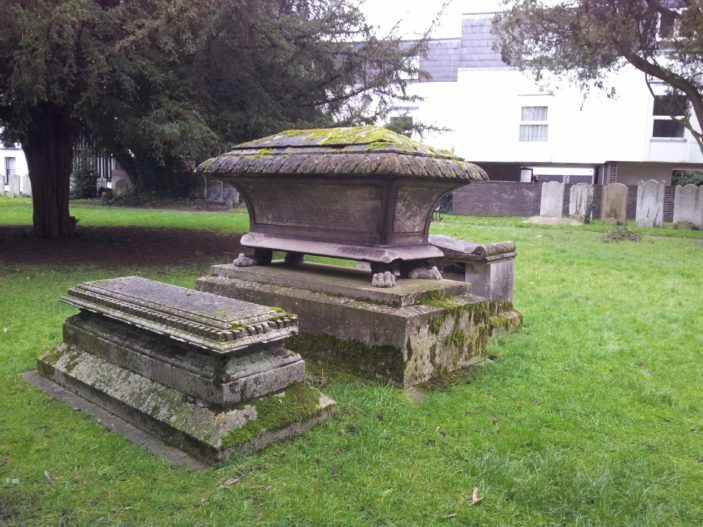 The Grade II listed ornate ‘sarcophagus’ tomb in the churchyard of St Mary’s is a striking memorial to Mr Edward Chuck, one of Ware’s most revered and prominent citizens of first half of the 19th century. He died in November 1852 aged 69, following a cart accident in High Oak Lane (this used to follow on from Crib Street until High Oak Road was built). The other side reads ‘In memory of Elizabeth Moore Chuck, widow of the late Edward Chuck who departed this life 14th January 1860 aged 74 years’. On Tuesday morning about seven o’clock, Mr Chuck was proceeding in a chaise to a farm of his, known as ‘Noahs Ark Farm’ in company with a carpenter named Hollingsworth who was going to do some work at the farm. Mr Chuck had passed through Crib Street and proceeded about 300 yards up High Oak Lane, when he met a cart drawn by two horses. The lane in question is extremely narrow, and the carter, on observing the chaise, drew up close to the bank and Mr Chuck went on at a walking pace, believing he had ample room to pass. He had not quite cleared the cart, when the horse swerved, and some part of the chaise came in contact with the hind part of the cart. A slight jerk was felt at the moment, and instantly the shafts snapped short under the front of the chaise, and the horse walked on with the shafts, pulling the reins with it and so causing the body of the chaise to pull forwards. Mr Chuck and Hollingsworth were thrown out side by side, but the fall of the latter was broken by the dashing-iron. Mr Chuck fell aside of the dashing iron heavily on his knee which was frightfully fractured by the concussion. Hollingsworth almost instantly got up and procured a chair from a neighbouring cottage, set Mr Chuck on it and went to Ware for Mr Chuck’s medical attendant and his close carriage. After the accident, he was said to be very calm and that the driver of the cart should not be blamed. He was known as a frank and hardworking man with genuine manners who was proud of his lower class origins. He was a lover of the arts, attached to the church and was generous with his subscriptions to various charities. At the time of his death, he was carrying on a large malting business in Ware, a wholesale lead and glass business in London and a handful of farms. He paid over £100 week in wages at Ware. An inquest was held at the Clarendon Inn (which stood where the former Wine Lodge now stands); the verdict being ‘accidental death’.